The darker the red, the greater the willingness to fight. Only 44 percent of adult Americans are willing to tell pollsters they’d fight for their country. The percentage is even less for some U.S. allies, such as Canada (30%), France (29%), the United Kingdom (27%), Italy (30%), Germany (18%) and Japan (11%). In contrast, 71 percent of Chinese and 59 percent of Russians say they’d fight for their countries. This is the result of a public opinion poll of more than 1,000 people in each of 64 countries in late 2014 by WIN / Gallup International. The complete results are below. I’m not sure what to make of this. 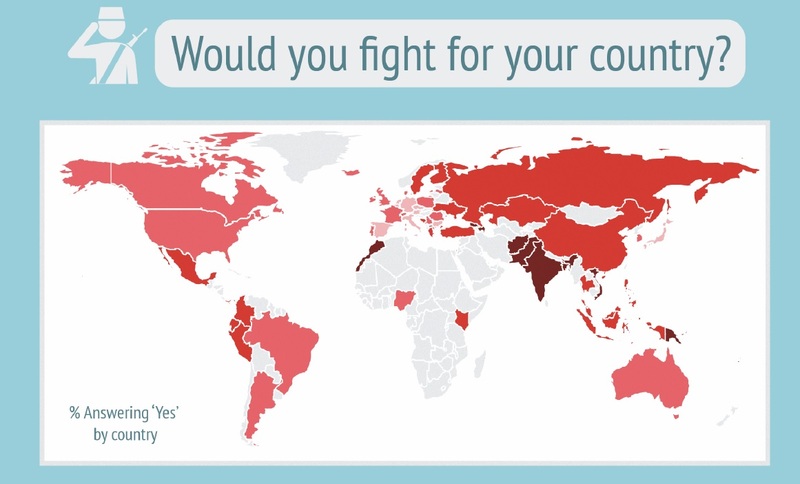 I think it partly depends on people mean by “fight for country”. I think almost all Americans would be willing to fight to defend our nation from an invader. I think only a minority are willing to go to some foreign country to fight to increase U.S. geopolitical power. The problem for us Americans is that someday U.S. power will begin to slip, and countries that now fear to go against the United States will become our enemies. When that backlash comes, our nation will need the patriotism that our leaders now exploit and abuse. Note that the coverage of North Africa and the Middle East, and of the majority-Muslim countries does not include the current war zones. Note also that the surveys included women as well as men. Some women who answered may have meant that they personally were not willing to serve in the military because they that was the role of men. WIN / Gallup International’s global survey shows three in five willing to fight for their country. Note that this is different from Gallup Inc. in New York City, which is what I usually think of as the Gallup Poll. 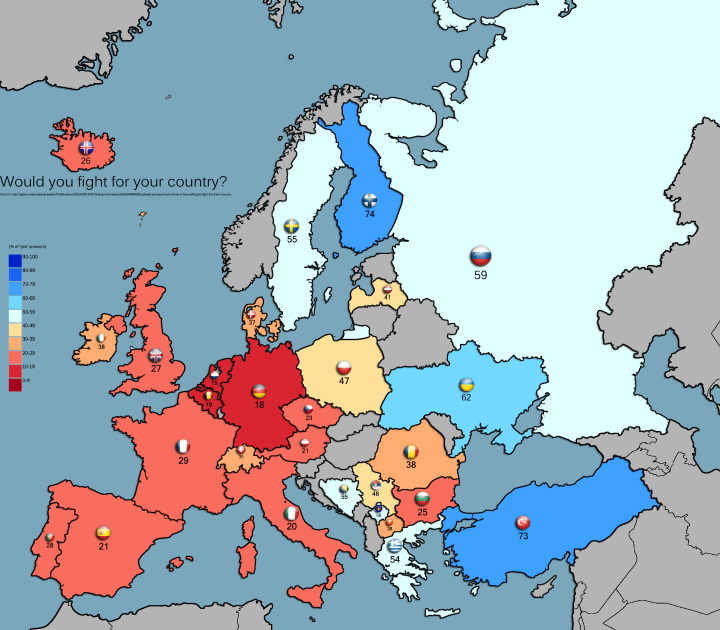 Percentage of Europeans Who Are Willing to Fight a War For Their Country by Brilliant Maps. This entry was posted on February 24, 2017 at 9:05 am and is filed under International, International Comparisons, War and Peace. You can follow any responses to this entry through the RSS 2.0 feed. You can leave a response, or trackback from your own site. Yeah, this is probably true. You can see it in these mamby pamby wus bag liberal “men”. They wont even stand up to Starbucks. But you see, the 44% are the Strong Proud Tough and Titanium made Conservative Christian Bible Thumping Gun Clinging Deplorable Americans that will and are fighting for our country. We will never stop. You liberals will never win. This is a 2015 article. The survey was done in late 2014. 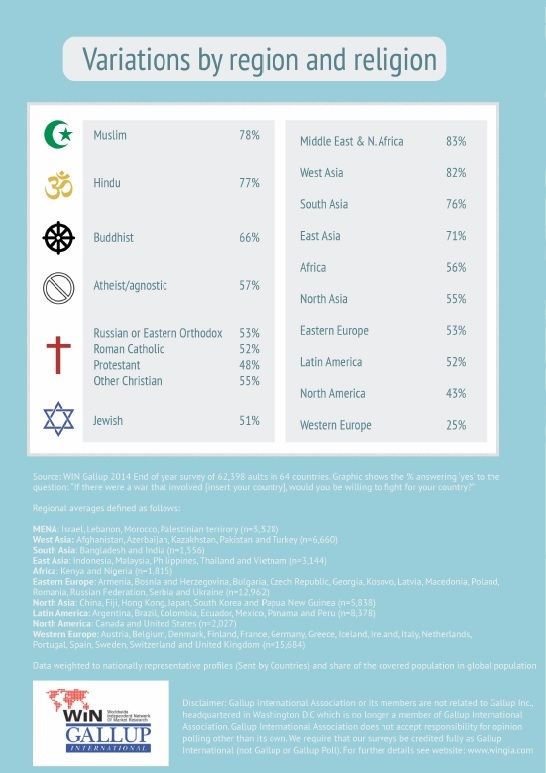 From a cultural point of view, the results of the survey are fascinating. One thing I wish folks would become more aware of is that there are MANY ways of supporting (and fighting) for one’s country. The idea that it can only be done with a deadly weapon in hand is ridiculous and ignores economically and socially successful countries around the world. In many cases (the US invasion of Iraq in 2003 is a prime example) military interventions (fighting in the deadly sense) only harm a country’s political and economic standing, and therefore, hasten its decline. The estimated $3 trillion price tag of that war (financed solely on credit) and the damage done to American credibility globally will continue to haunt Americans for decades to come. Thanks for posting these interesting findings! Most Americans would fight to defend the country. But the last time the US fought a war of defense, as opposed to a war of aggression, was World War II. Few Americans are interested in sacrificing their lives to ensure that rich people can maintain their geopolitical power and corporations can maintain their trade relations and trade routes. Being the subject of an empire generally is less inspiring for patriotism than being the citizen of a free country. The US over time has increasingly become an empire, although it was turning in that direction pretty early on. The US has also loss much of its social capital and political legitimacy around the world, not only among its own population. That is a dangerous position to be in, especially as Trump is eroding our alliances. World War III might not be a good experience for the US with neither strong support from Americans or from allies. But those like Bush and now like Trump think we don’t need anyone else. America first means America in isolation. No empire lasted for long in isolation. Not that I’ll be sad when the American empire collapse, as I’m not a fan of imperialism.